A platform for innovation and change – The Ocean Summit, during the Cardiff stopover, has seen a range of announcements that provide further momentum in the fight against plastic pollution. Cardiff stopover. Ocean Summit. 05 June, 2018. Announcements from the Welsh Government, Iceland Foods and new microplastics data from the Volvo Ocean Race Science Programme all helped advance the growing movement to turn the tide on plastic. At the event, in the Cardiff Race Village, the Welsh Government signed the country up to the United Nations Environment’s #CleanSeas campaign alongside World Sailing and the International Olympic Committee. The Welsh Government also said that drinking water would be made available along the 870-mile Wales Coast path to help reduce the use of single use plastics. Iceland Foods Group revealed the extension of their in-store trial of a Deposit Return Scheme. The reverse vending machines accept Iceland’s empty plastic beverage bottles and repay customers with a 10p voucher for each recycled bottle, to be used in store. Meanwhile, Sky Director Robert Tansey, gave a keynote speech on the impact of the Sky Ocean Rescue campaign on the use of single-use plastic and the organisation’s efforts to remove them from their supply chain. 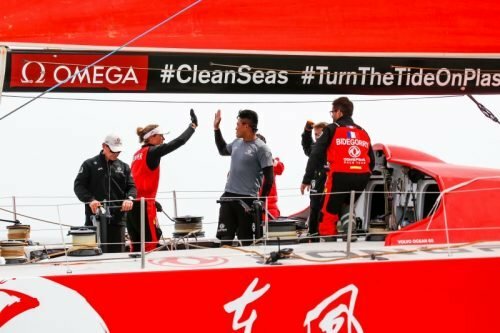 And the Volvo Ocean Race Science Programme unveiled microplastics data from Leg 8 of the Race from Itajaí in Brazil to Newport, USA. The new information, collected by race boats Turn the Tide on Plastic and Team AkzoNobel, found 157 particles per cubic metre close to Itajaí and 71 particles per cubic metre near Newport. 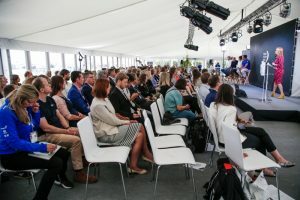 Anne-Cecile Turner, Volvo Ocean Race Sustainability Programme Leader, said: “The series of Ocean Summits are raising the bar as a forum for collective, creative, ground-breaking initiatives to the environmental plastic problem affecting our oceans. Presentations and discussions focussed on our understanding of plastic pollution and innovative solutions to it, the role of NGOs and how sport is providing a blueprint for a sustainable future. The event heard from Fredéric Michel about the importance of innovation in the field and Sky Ocean Ventures, a £25m innovation fund committed to investing in new ideas and businesses who can help solve the oceans plastic crisis. A host of international speakers included Tony Juniper CBE, Hannah Blythyn, Welsh Minister for Environment, Lisa Svensson, Director for Ocean, United Nations Environment, Mark Towill, Co-Founder & Team Director, Vestas 11th Hour Racing, Sky Director Robert Tansey, Jocelyn Bleriot, Executive Officer, Ellen MacArthur Foundation, Wendy Schmidt, President of The Schmidt Family Foundation, co-founder of Schmidt Ocean Institute and Julie Duffus, Olympic Movement Sustainability Manager and Fredéric Michel, Group Director, Impact Investment, Sky Ocean Ventures, Sky Plc. Sky News presenter Sarah-Jane Mee was the master of ceremonies for the half-day event. To date, Ocean Summits in Alicante, Cape Town, Hong Kong and Newport, Rhode Island, have already resulted in governments, business and a range of ocean advocates leading by example by making solid commitments to help stop the ubiquitous spread of plastic in our seas. Recent research carried out by Bluewater, Volvo Ocean Race Sustainability Partner, found that one-in-two Britons worry their tap drinking water contains contaminants including microplastic particles. The Volvo Ocean Race Sustainability Programme is a partnership in collaboration with Sustainability Partners 11th Hour Racing, the Mirpuri Foundation and our other main partners, Volvo, AkzoNobel, Ocean Family Foundation, Stena Recycling and Bluewater.